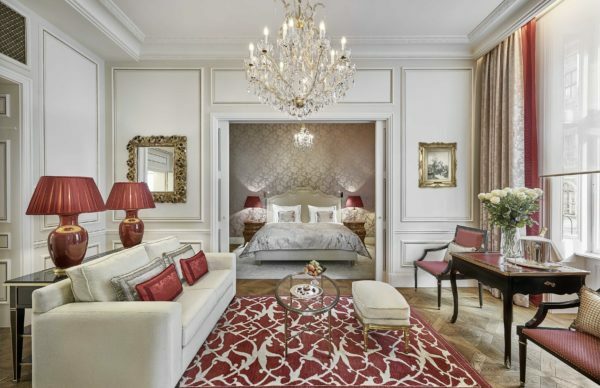 Ideally located in the heart of the Austrian capital, opposite Vienna’s famous State Opera, the Sacher Vienna is a luxurious 5-star hotel welcoming families for a refined and rich experience. 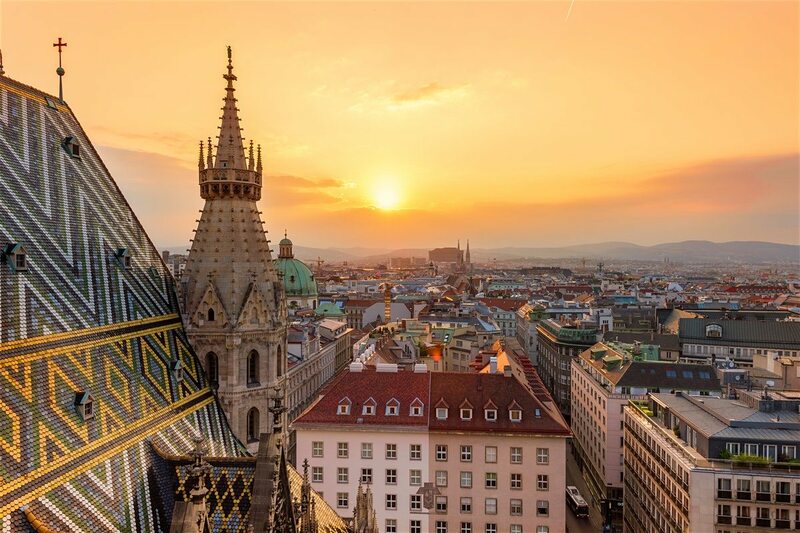 Bordering the most important pedestrian zone of the capital (Kärntner Strasse), its location makes it easy to reach the main cultural attractions such as the Imperial Palace of Hofburg or the Spanish School of Riding. 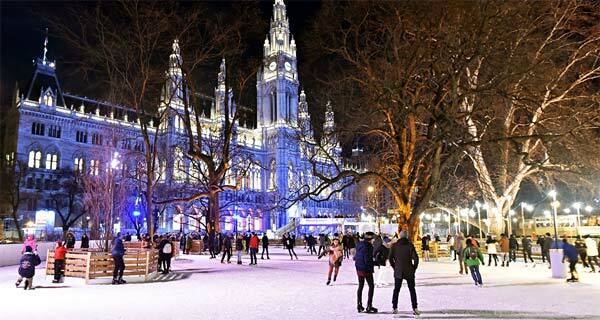 The hotel is less than 30 minutes from Vienna International Airport (Schwechat). 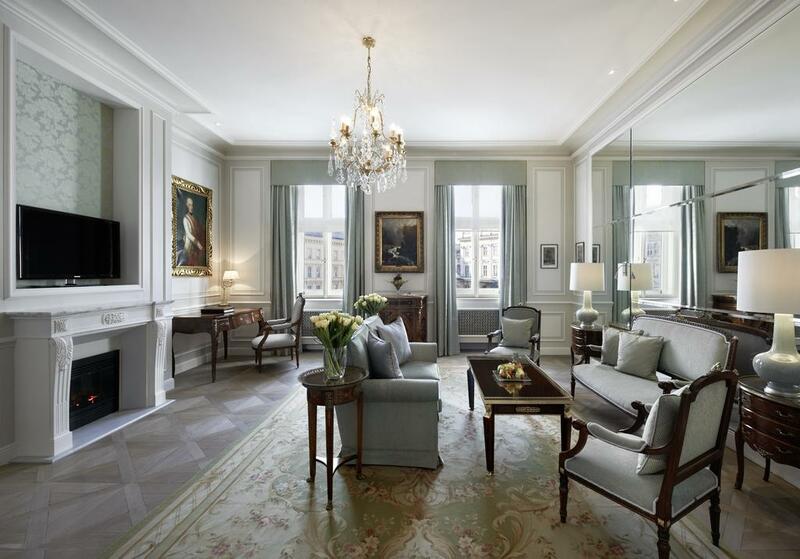 The refinement and charm of yesteryear emerge from the interiors of this splendid building. 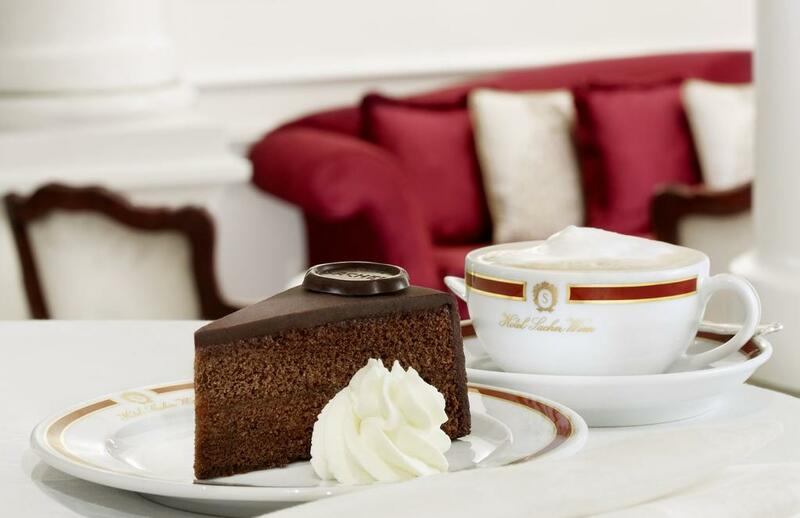 A true institution, the Sacher has welcomed in its walls the highest representatives of the Viennese nobility and the high international society. 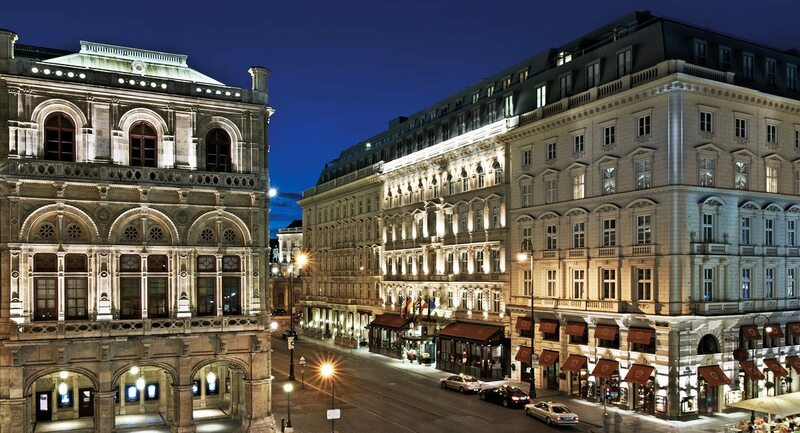 It was in 1876 that the hotel was born, under the aegis of Eduard Sacher, son of the creator of the Original Sacher-Torte (or Sachertorte, delicious chocolate cake, an essential part of Austrian cuisine). 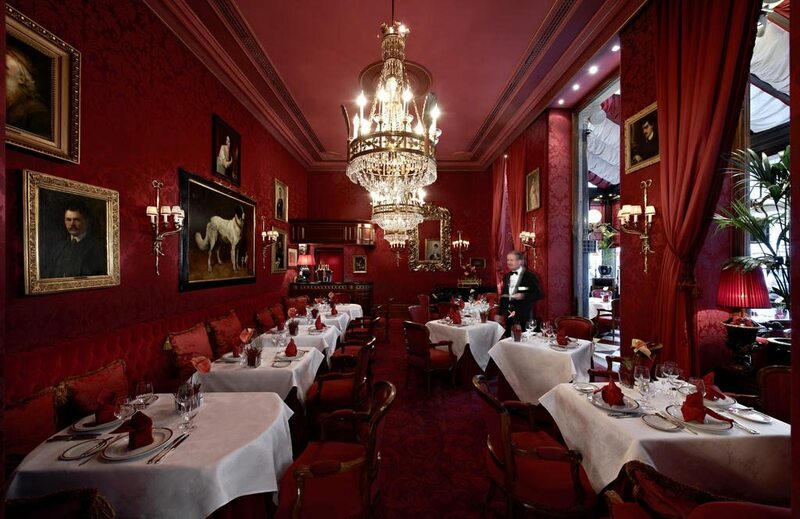 Today, the Sacher is the only luxury hotel in the city to belong and to be managed by private individuals. 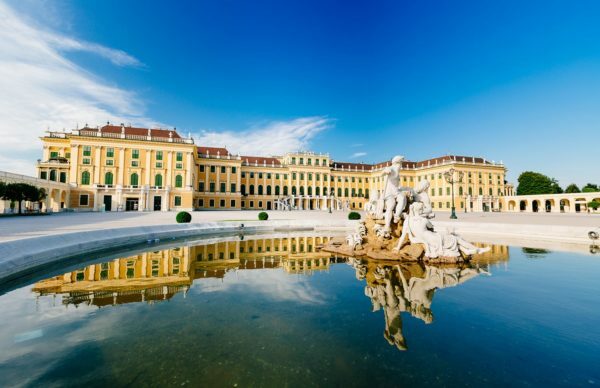 The Gürtler and Winkler families are now working to preserve the high-end values ​​and services of the establishment, in the tradition of the ancient Habsburg monarchy. 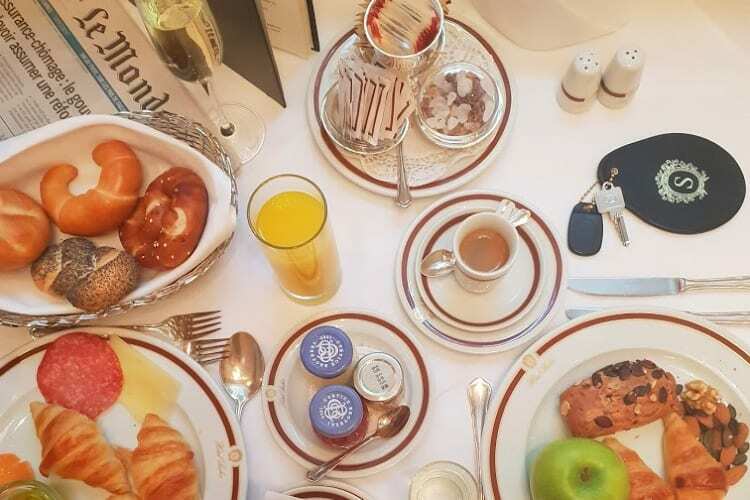 The establishment offers its guests 150 rooms and suites, 5 restaurants and bars, 1 spa, 1 fitness center, 1 parking (with valet parking), 1 business centre and conference rooms. Wi-Fi access is available throughout the hotel and check-in service is available 24 hours a day. 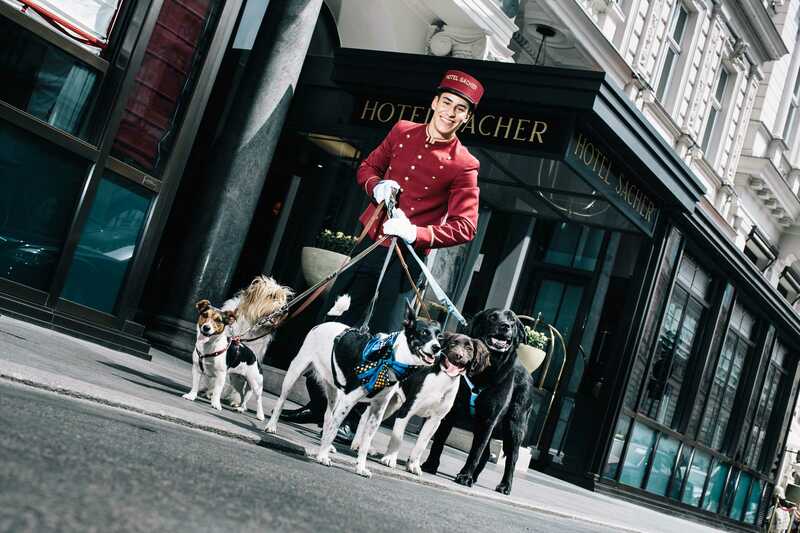 In a family, each member counts and no one is left out, and the Sacher welcomes you with your pets. On request, many services are available: limo rental, laundry, babysitting. The rooms are big: good news for families! Their areas range from 30 sqm (320 sqft) to 150 sqm (1615 sqft). 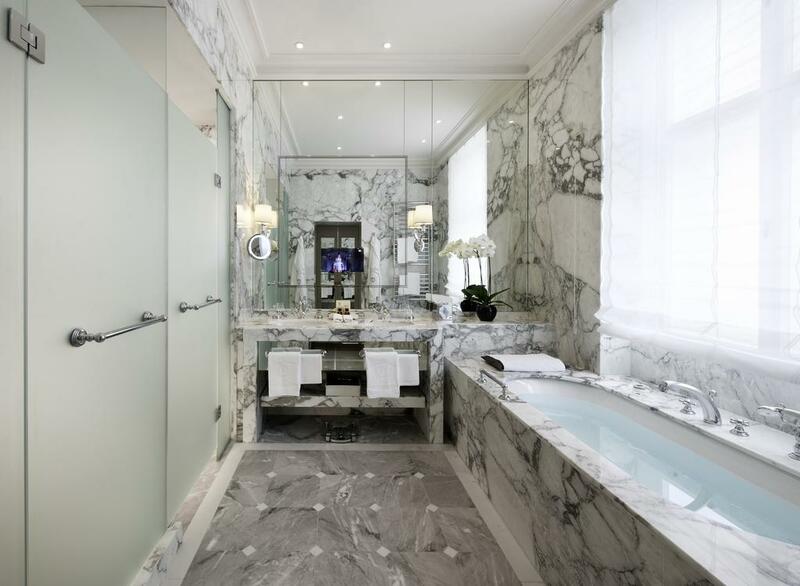 Ideal for families, the Junior Suites and Deluxe Junior Suites (50 sqm – 530 sqft and 70 sqm – 750 sqft) feature elegant marble bathrooms with separate showers and bathtubs. 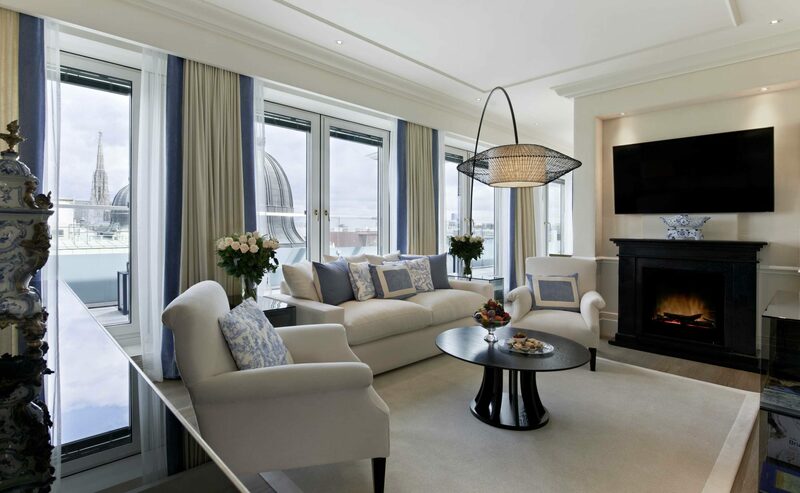 These suites combine a bedroom space and a lounge area, arranged to visually form two distinct spaces. A child’s bed can easily be integrated. The Deluxe Junior Suites also offer magnificent views of the National Opera and / or the Albertina Galleries. 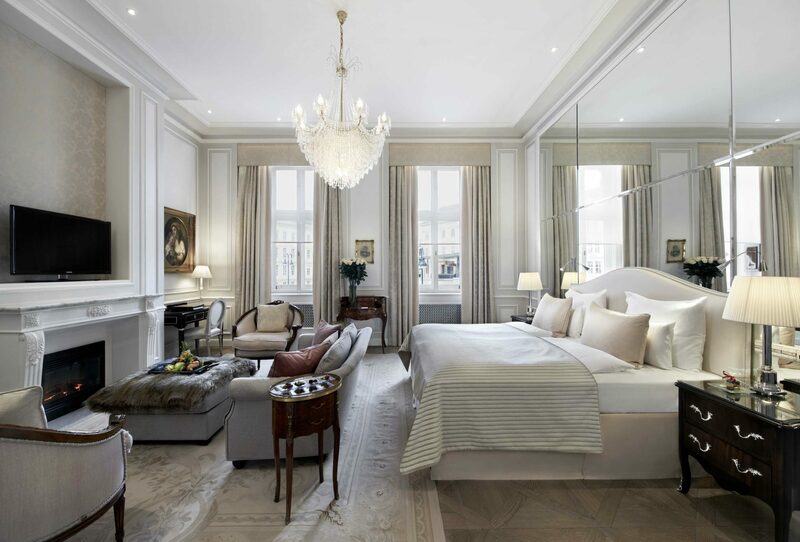 So that parents and children each have their own room, two-bedroom Suites (from 80 sqm – 860 sqft to 110 sqm – 1180 sqft) are proposed and comprise 2 bedrooms, 1 living room and 1 bathroom in marble. 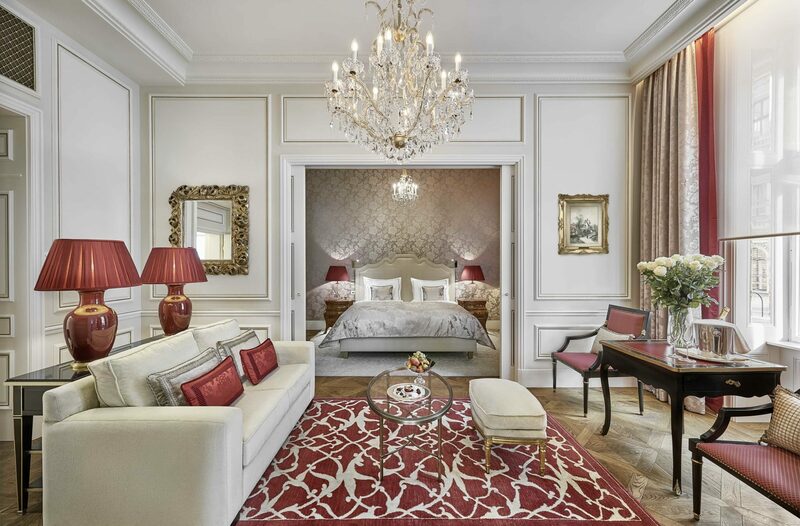 If you want to enjoy a unique experience, the Presidential Suite “Pelleas and Melisandre” (inspired by the work of Debussy) offers 110 sqm (1180 sqft) of luxury, comfort and is decorated with very rare works of art. 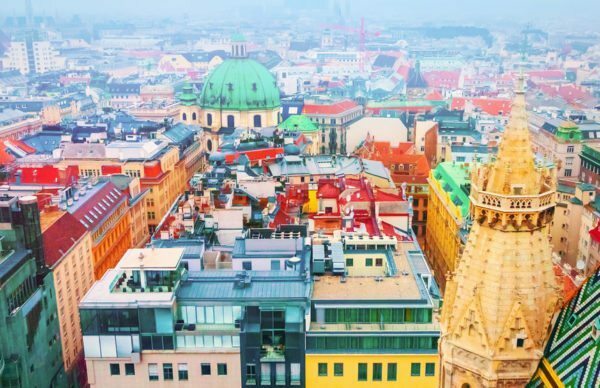 Its bay windows and terrace offer a breathtaking view of Vienna. 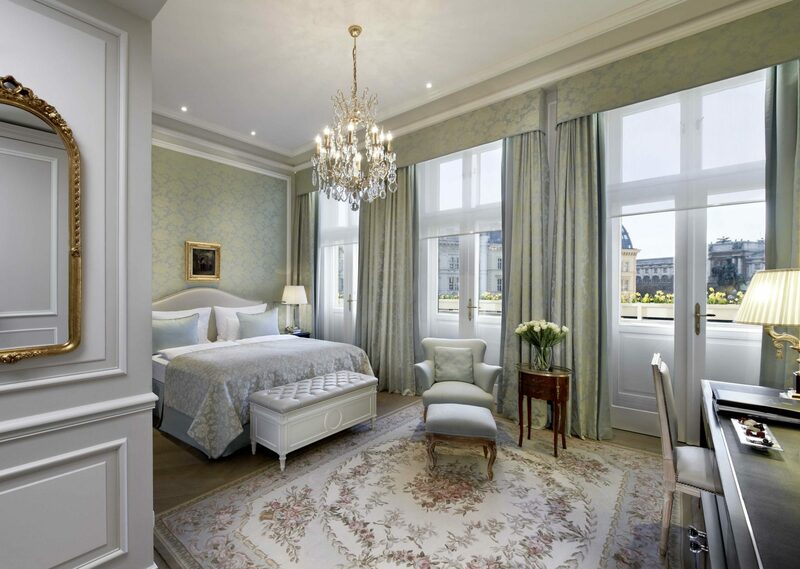 On request, the Presidential Suite can be connected with the Nurejev Suite for a total area of ​​175 sqm (1880 sqft). 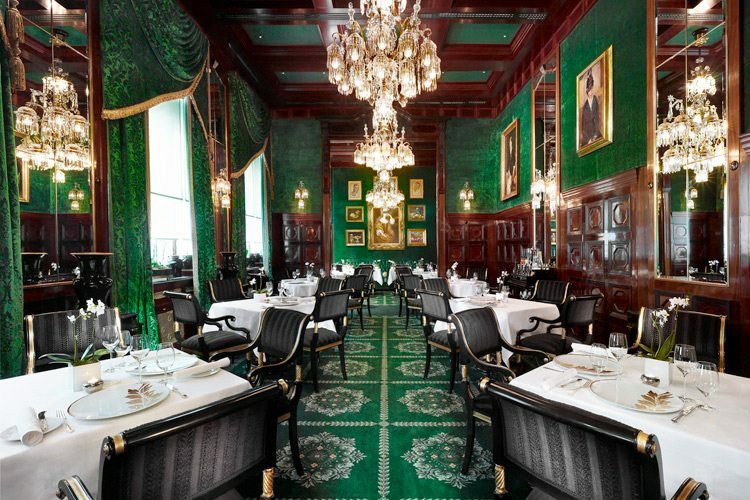 International cuisine or typical Austrian dishes, the Sacher’s restaurants offer you a plethora of choices to satisfy your taste buds. 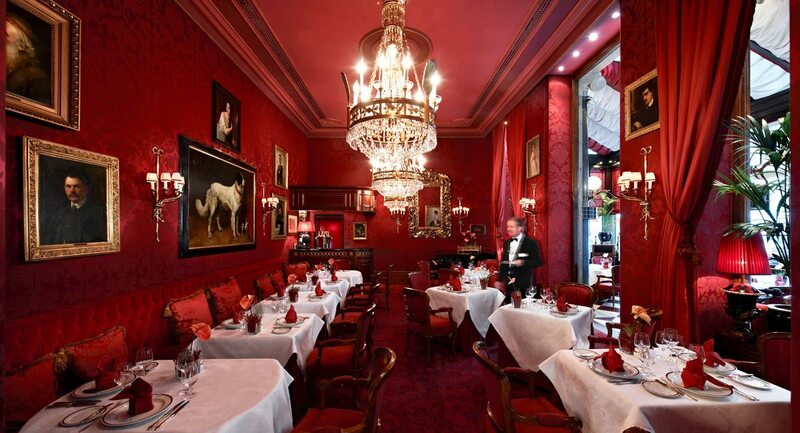 As an aperitif or at the end of the evening, the Blaue Bar invites you to relax. 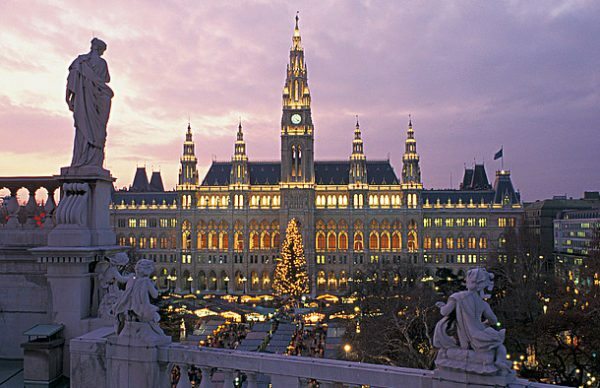 From noon to midnight, the Rote will introduce you to Viennese specialties. 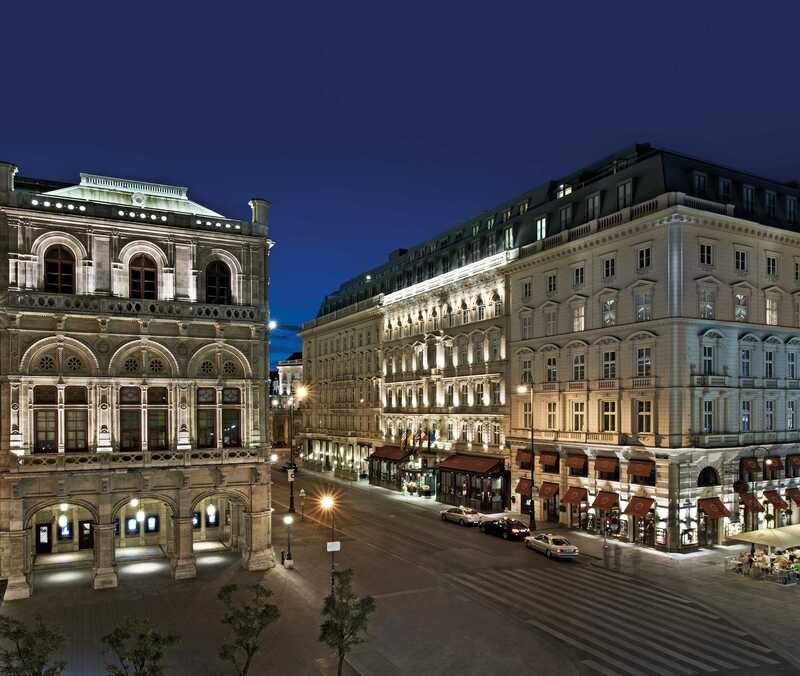 At 19h, you can enjoy a live piano bar. 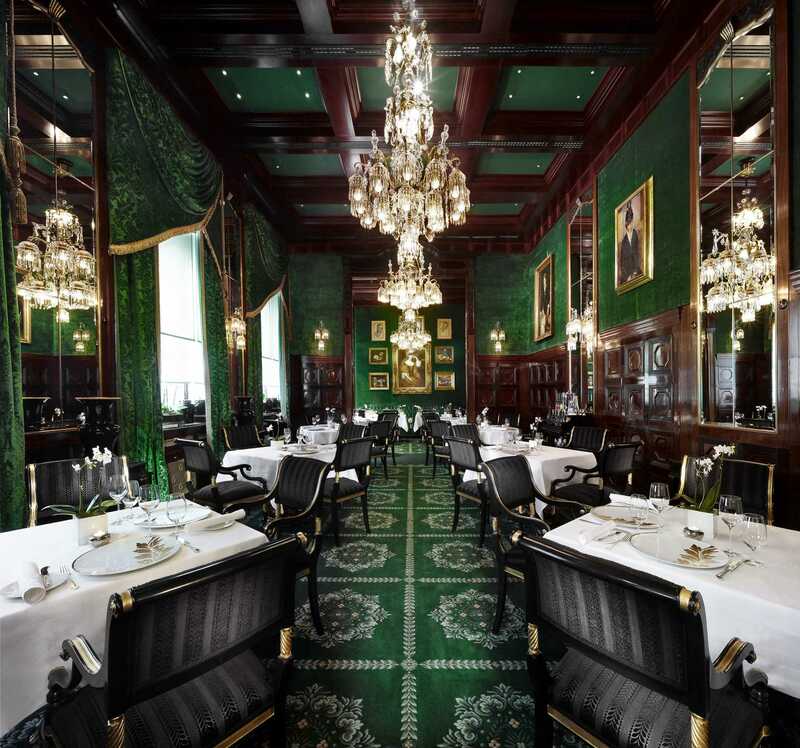 At Restaurant Grüne Bar, the chef, Dominik Stolzer, puts his creativity to the service of gastronomy for a dinner that is rich in flavours (open from 18h to midnight). 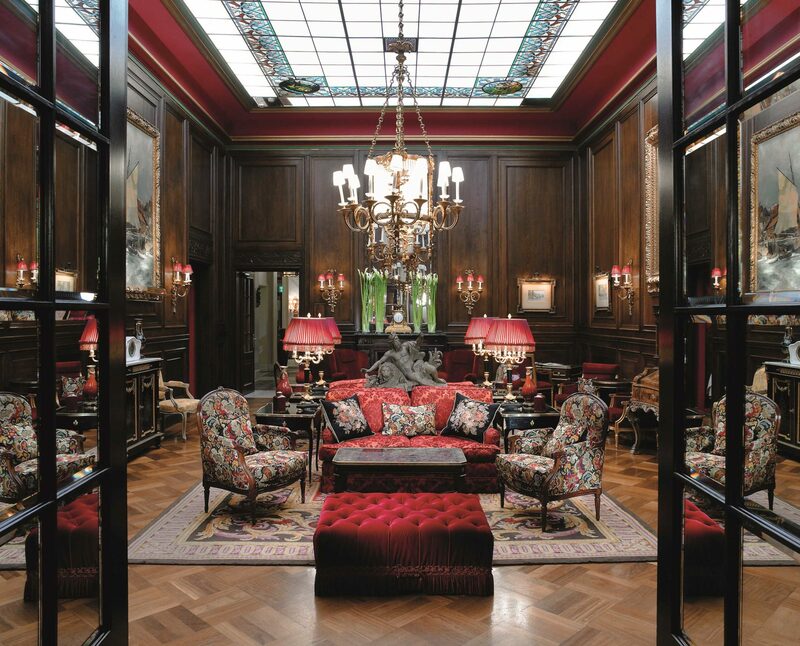 The New Sacher Eck is one of the most recent innovations of the establishment and is now spread over two floors. You can meet there as a family for a moment of conviviality. While parents enjoy a glass of wine, children can marvel at the concept of the ‘Sacher Confectionery’ with its delicious pies and sweets. 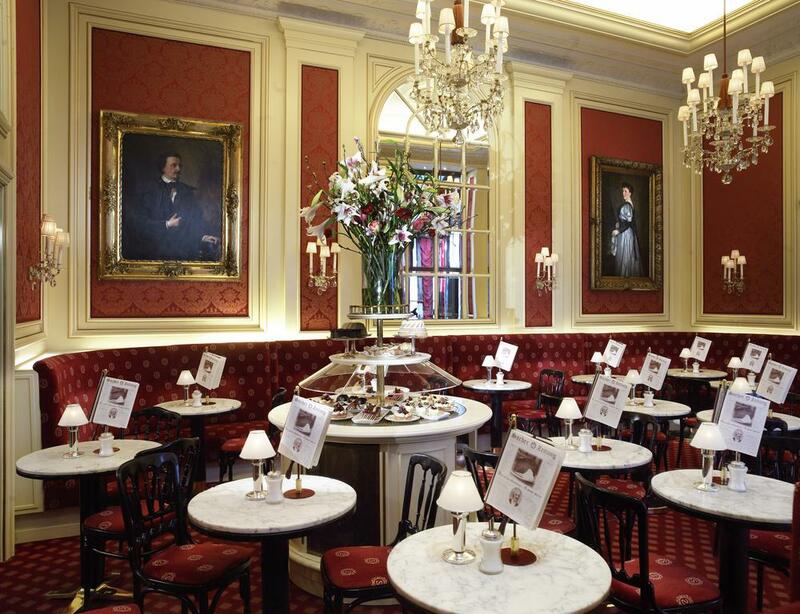 Finally, Café Sacher Wien is open all day. Children’s menus are available in the various restaurants of the hotel, do not hesitate to ask the Chef special attention for your little ones. 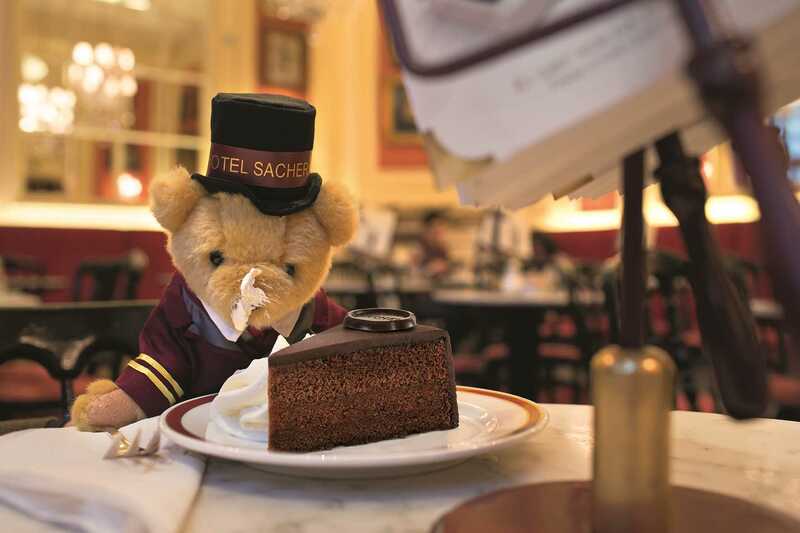 Franz, the bear-mascot of Hotel Sacher, welcomes children. Thanks to the package ‘Petit Sacher’, every child will find on arrival in their room a nice welcome gift, the booklet “My Hotel Sacher” full of tricks and games to discover the hotel while having fun, a bathrobe for children and non-slip slippers, games and soaps adapted to the skin of children so that bath time is a fun time, a collection of DVDs and board games. ‘My Hotel Sacher’ is an adorable little guide that is offered to each child and is specially designed in children’s language so that young travelers can discover all the secrets of the hotel! 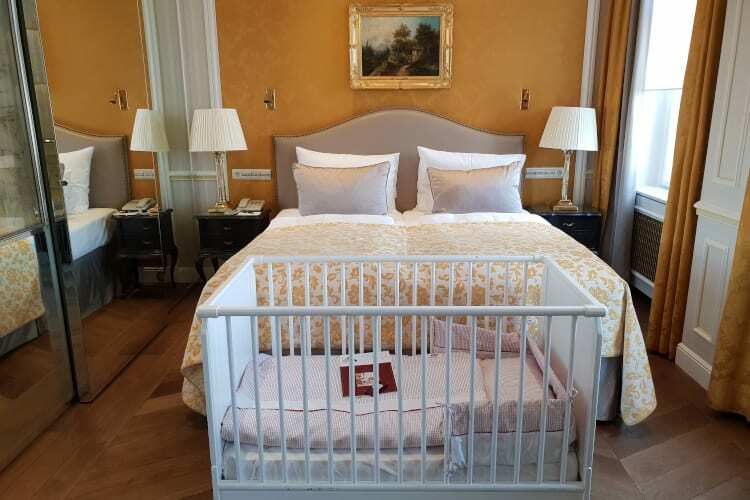 Of course, an additional cot or crib may be placed in Mom and Dad’s room. For any additional request (baby bottles, pacifiers, high chairs) the personalized concierge of the hotel will take care of your needs. A babysitting service is also available. 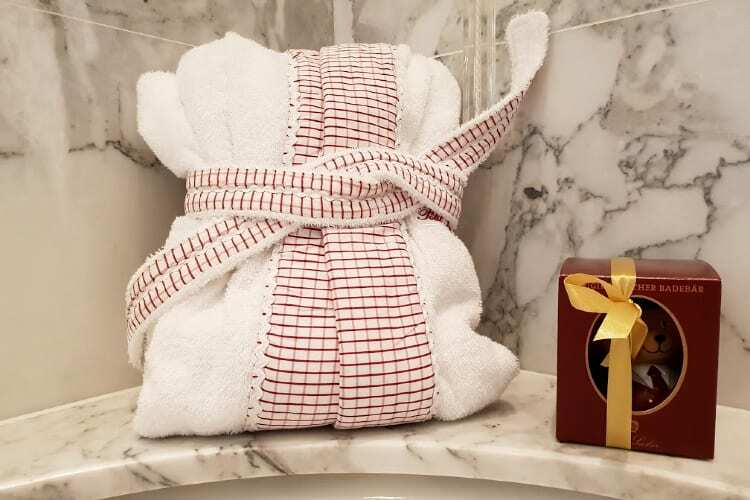 Concerned about the well-being of its young guests, the Sacher Boutique Spa has developed a care card specifically dedicated to children and adolescents: the ‘Petit Sacher Spa’. 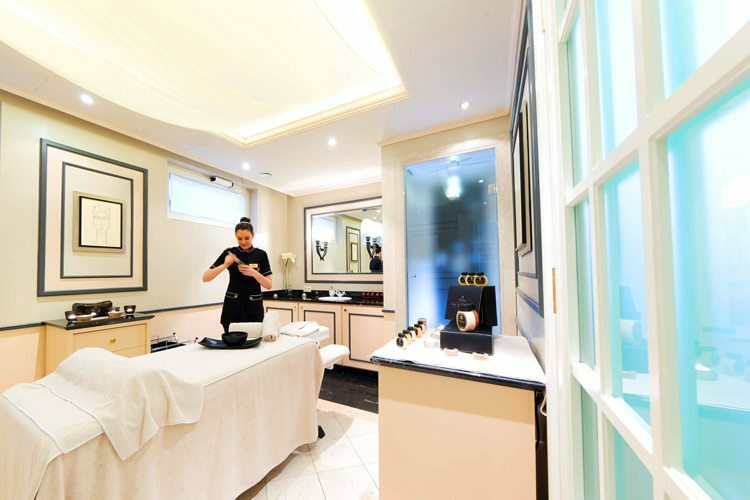 On the programme: mini manicure, mini pedicure, and also relaxing massages and facials! 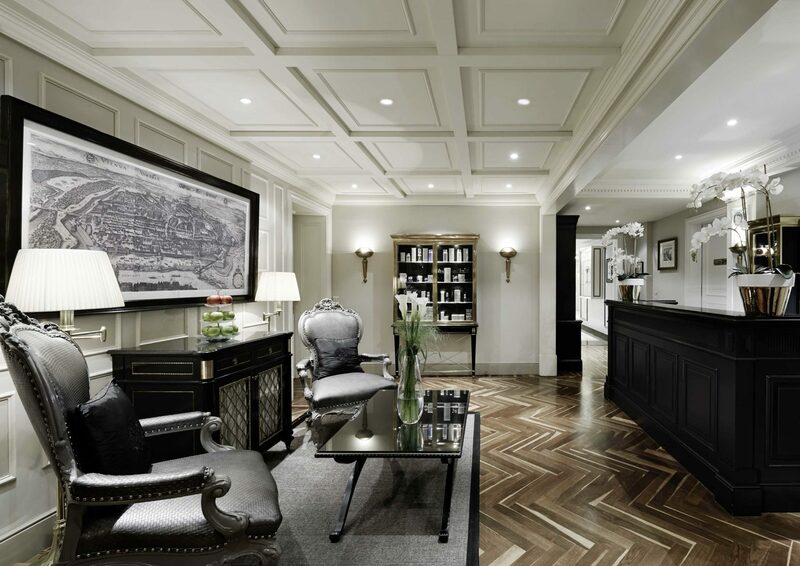 Not to be missed: the ‘Rockstar Facial Treatment for Teenagers’, a complete treatment of 45 minutes, consisting of a peel, a mask and advice adapted to the skin of teenagers. 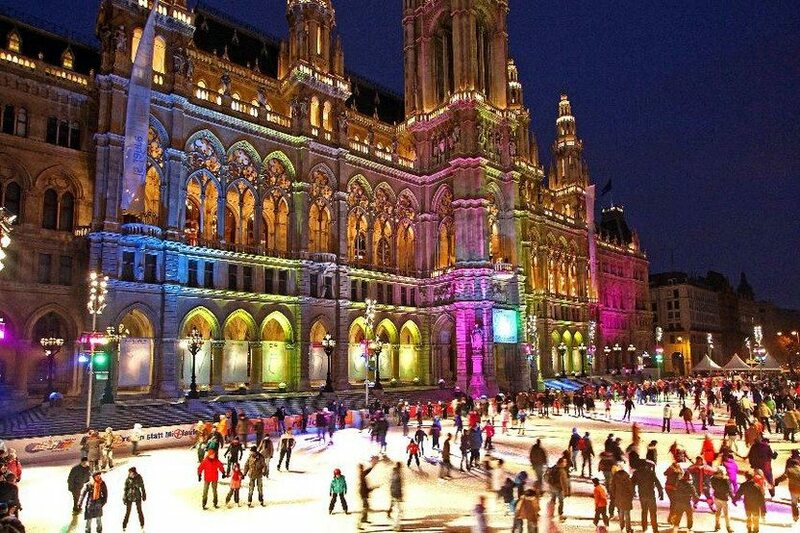 To visit Vienna is an opportunity to stroll with your family to enjoy history, trendy cafes and classical or modern museums. 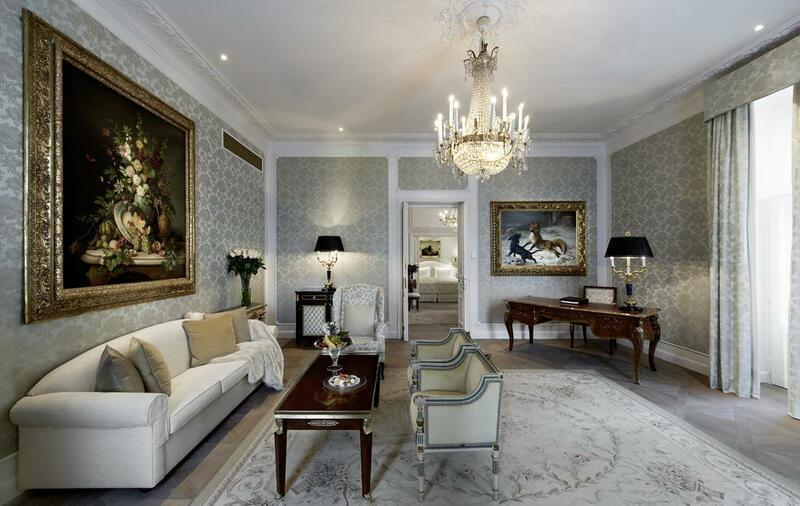 The Imperial Palace (located 10 minutes walk from Sacher) welcomes visitors for an experience in three stages: the museum of the famous Empress Sisi, the imperial apartments and the vast collection of silverware. At your leisure, you can take tickets for one or more of these stages. 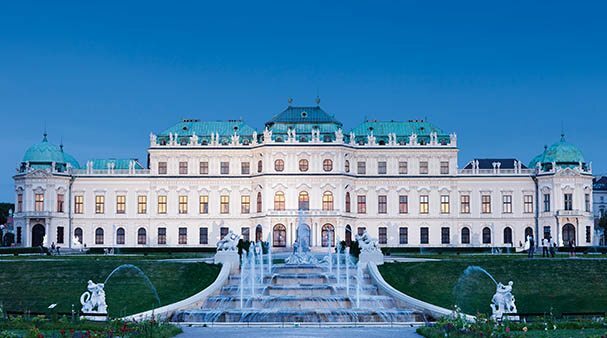 The most complete formula including a tour with audioguide and access to the collection of imperial furniture amounts to 29.90€ per adult and 18€ for 6-18 years. Everything is free for children under 6 years old. 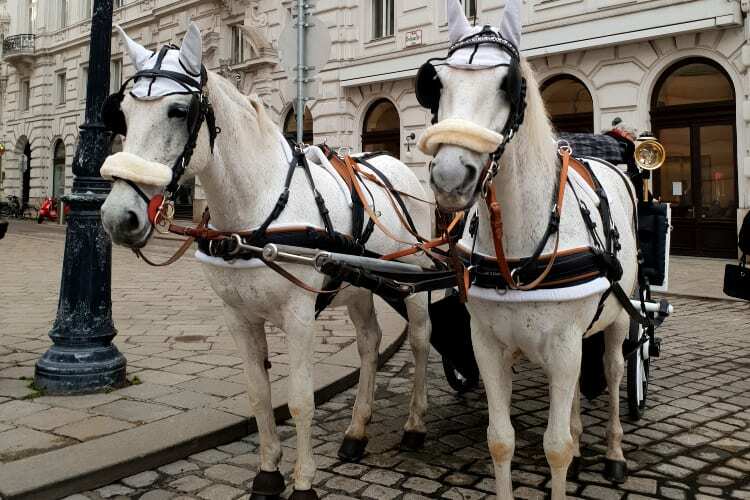 Whether you are passionate about horses or not, the Spanish School of Riding Vienna (located 8 minutes walk from the hotel) is worth a detour! 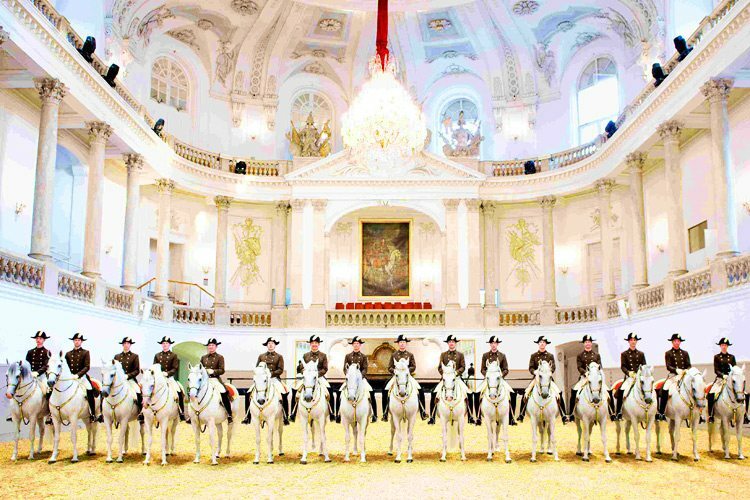 Young and old will be amazed by the sumptuous white horses (Lippizans) performing their moves, like real dancers. Listed on the lIntangible Cultural Heritage of Humanity list, this prestigious school opens its doors several times a day to visitors. The infrastructures are impressive. Around 10h, the first training of the day is accessible to visitors for the price of €15. 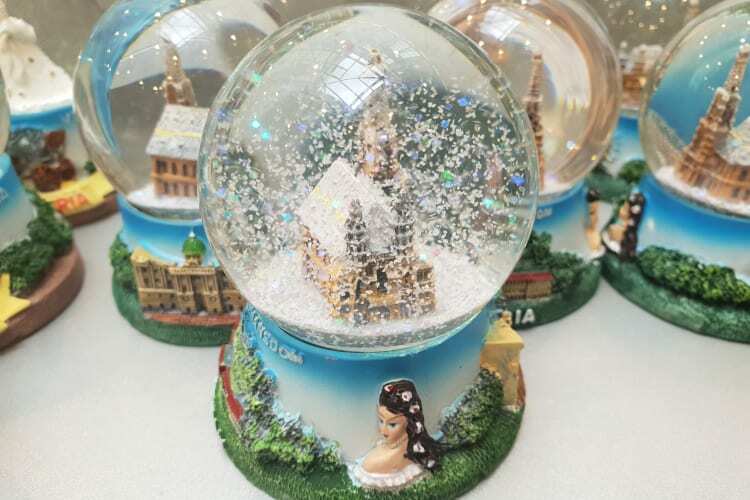 This session lasts approximately 1 hour and takes place to the sound of traditional Austrian music and under the sumptuous crystal chandeliers adorning the indoor arena. For a day full of emotions, Prater Park is ‘the place to be’! 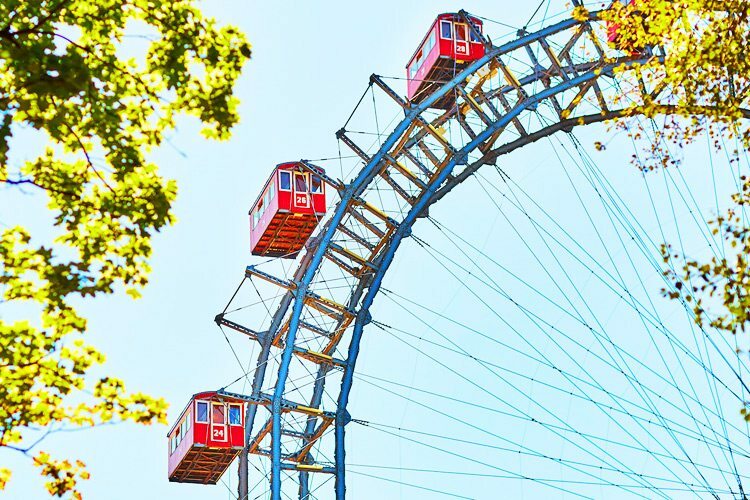 This gigantic park located 15 minutes drive from the Sacher has great green spaces to walk around in, a big wheel to get high with the family, roller coasters and the famous Madame Thussaud’s wax museum, to give you a photo shoot in the company of your favourite stars. Various dining options are also available. 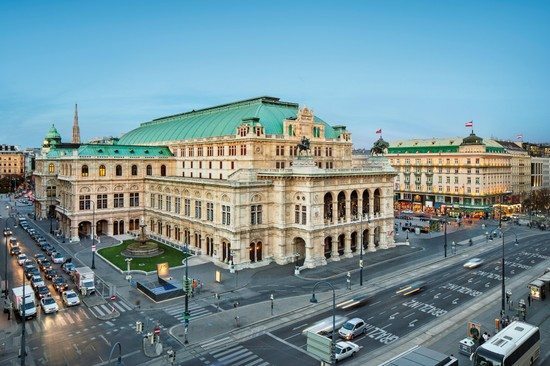 Just opposite the Sacher stands the famous Vienna Opera. 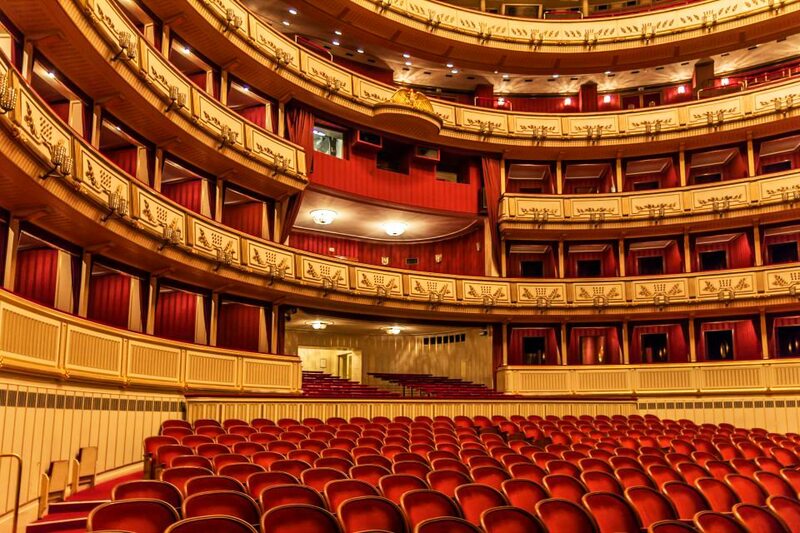 From only 10€ you can attend a performance. 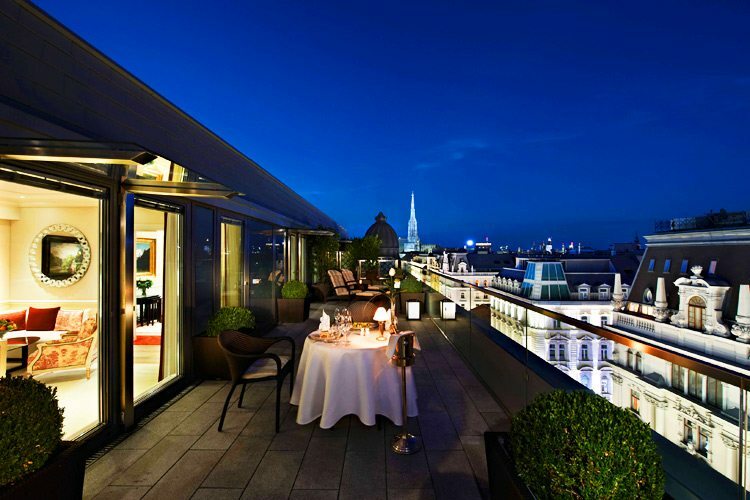 A unique experience, which is ideal to combine with a romantic dinner. 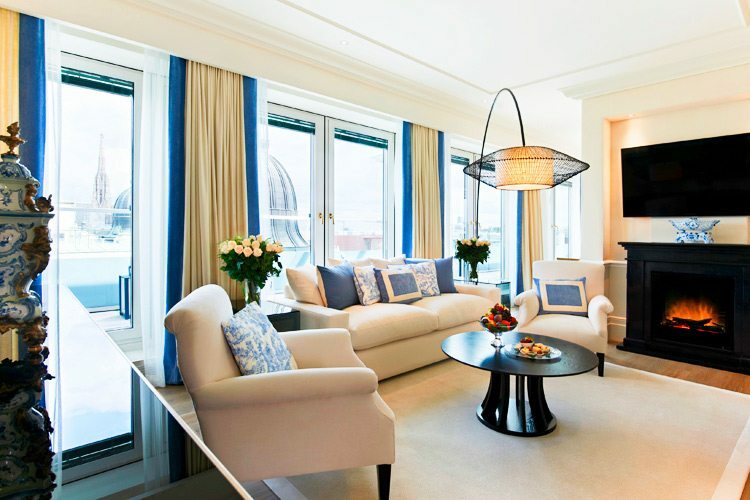 Before you go there, you will have time to sip a cocktail in the hotel’s Blaue Bar. 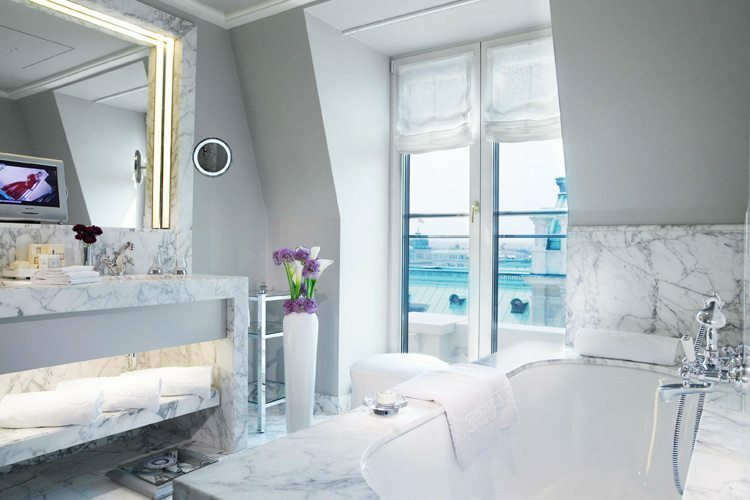 Located on the 5th floor of the hotel, the Sacher Boutique Spa is equipped with a sauna, a steam room, aroma-scented baths, massage showers and relaxation areas. 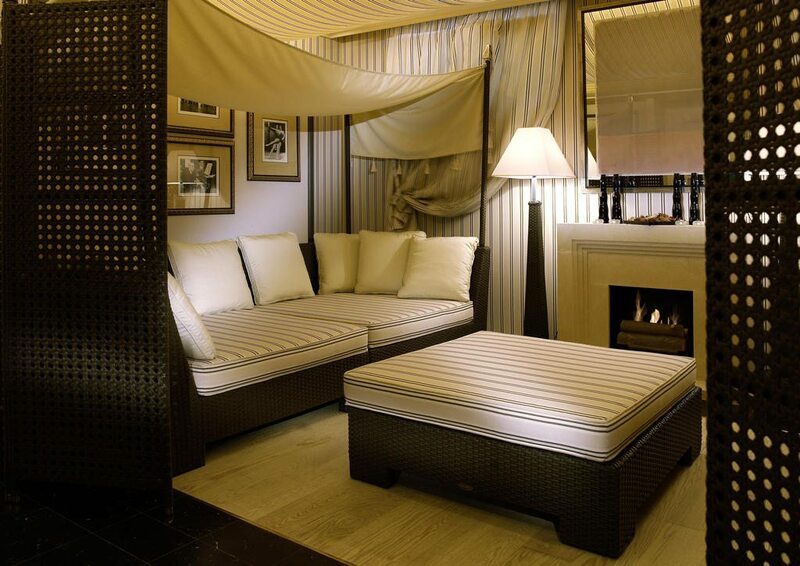 A wide range of treatments is available à la carte – make your choice and enjoy one of the spa suites. 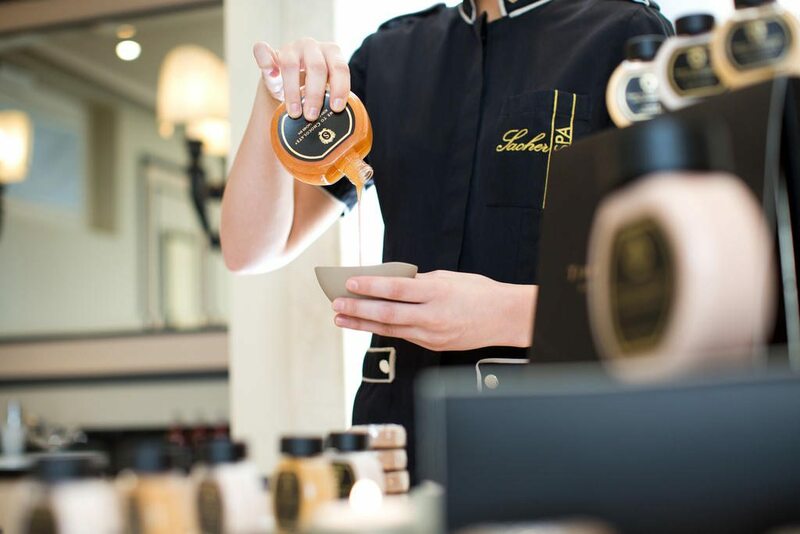 The gourmet afficianados will be tempted by the programme ‘Time for Chocolate’ and its variation of treatments based on cocoa. 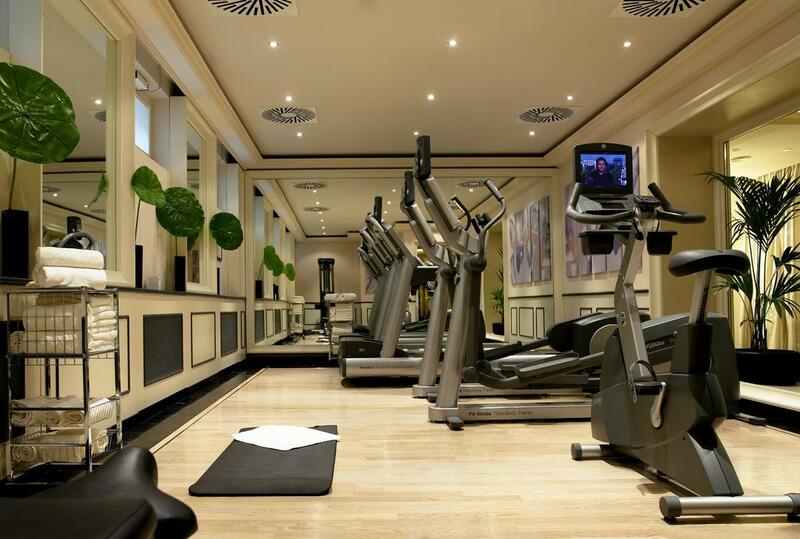 The fitness room is free for a workout, before or after a good time at the spa. 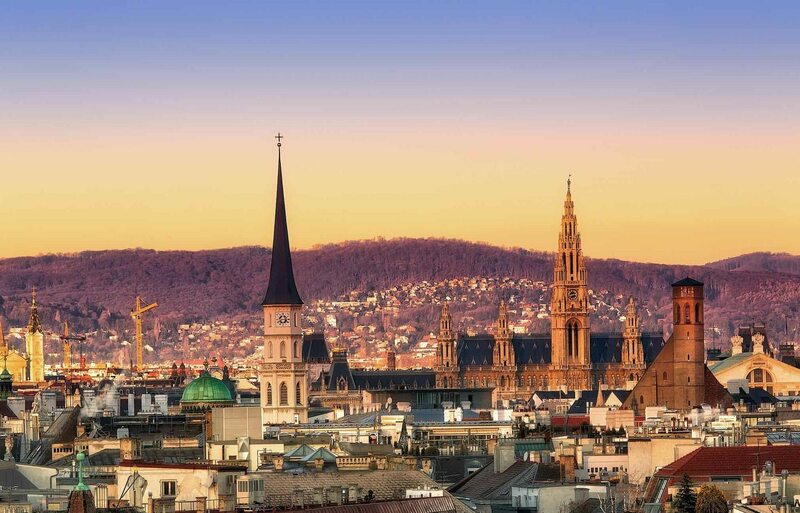 A 10-minute drive from the hotel, those interested in psychoanalysis can walk in Sigmund Freud‘s footsteps. The Freud Museum is housed in the former home of the emminent professor and houses archival documents, as well as the waiting room and cabinet in which Freud received his patients. A babysitting service is available at an extra cost to help you fully enjoy your activities. As long as i can remember, I have always associated the city of Vienna to TV series « Sissi ». The grand decors of her palace, her beautiful ball gowns, and the top of her magnificent hair do, pressed against Franz’s chest, all these fairy-tale like images where part of my childhood, every Wednesday afternoons comfortably seated on Nonno and Nonna’s couch who happened to be huge fans of the forever beautiful and missed Romy Schneider. 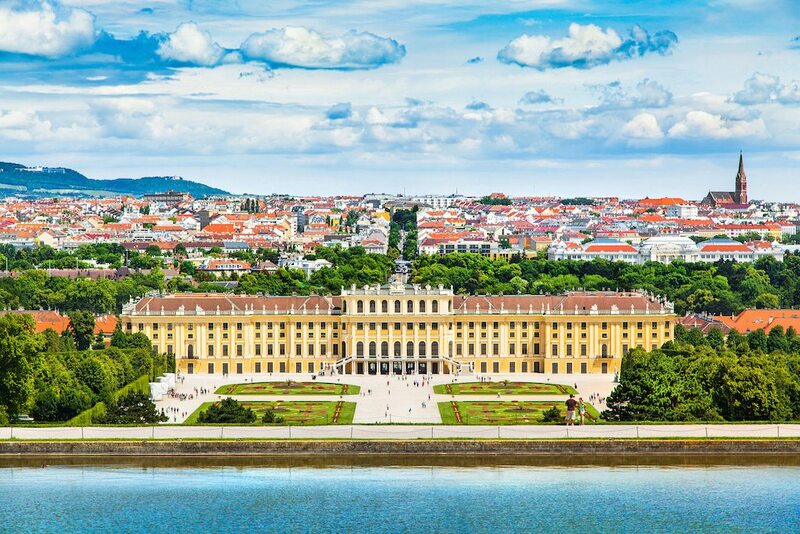 Today I am not a little girl anymore, but a very happy mother who cannot wait to visit the Austrian capital for the first time with my husband and our little 2 years old prince. 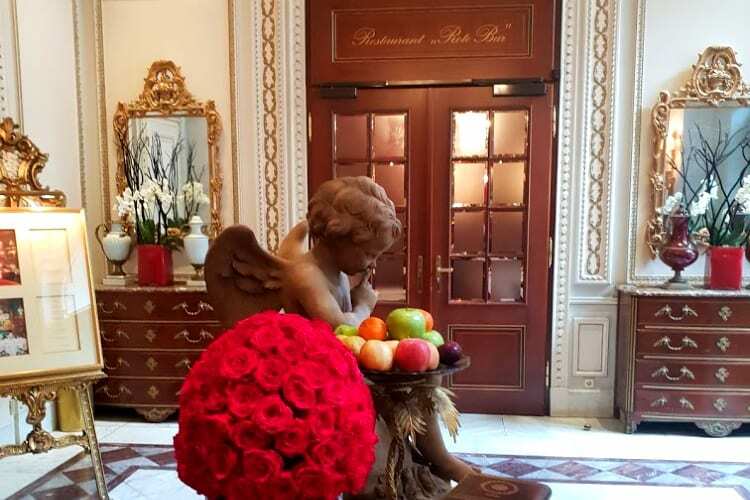 Upon our arrival at the Sacher hotel, we are greeted by the valet parking service and the doorman. The first one takes care to unload our luggage from the limousine, while the other takes us to the reception desk. The door man is so elegant in his work attire. 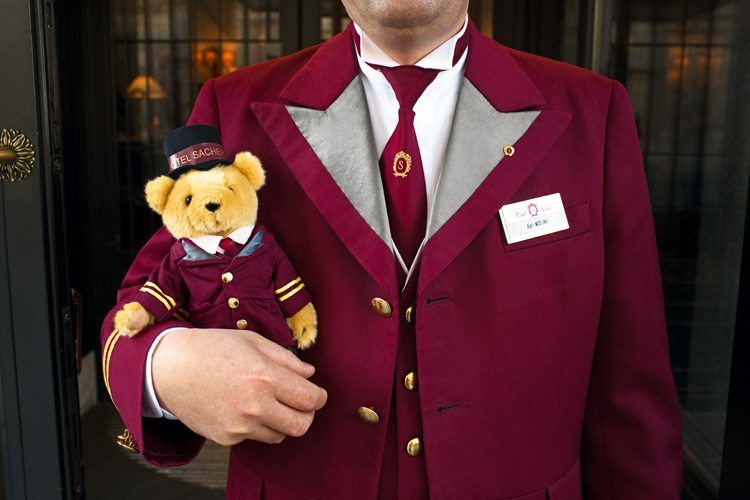 He wears a uniform that harbor the colours of the hotel and a hat, that was immediately noticed by Oscar. In 2 seconds the accessory is placed on our delighted little prince’s hair. The doorman guesses our Italian roots at the pronunciation of our last name on our reservation. While we wait for our check in, the 3 of us have a conversation in our mother tongue naturally. The decor of the reception is gorgeous. 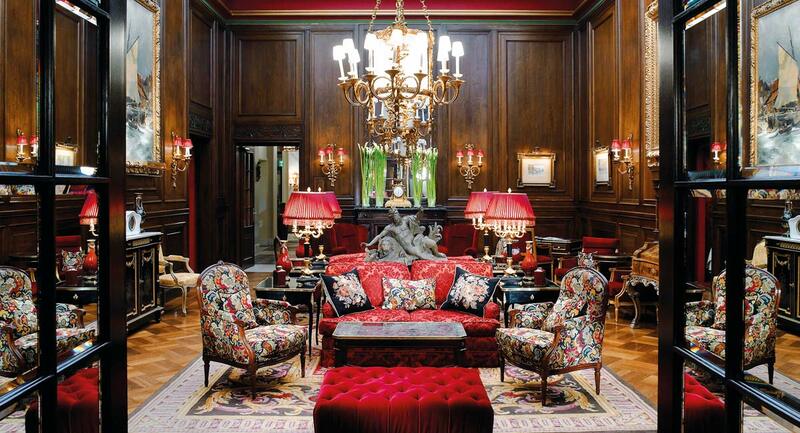 The walls are covered in red velvet tapestries with black baroque style motives. 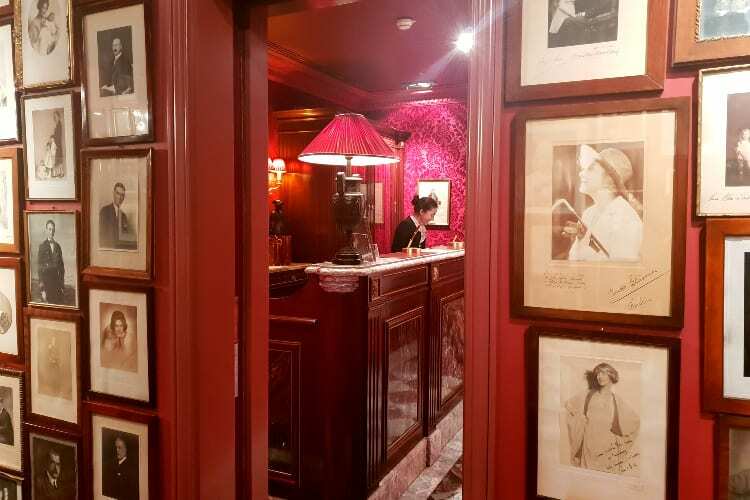 On which are hanged pictures of the celebrities that have stayed at this mythical address in Vienna. 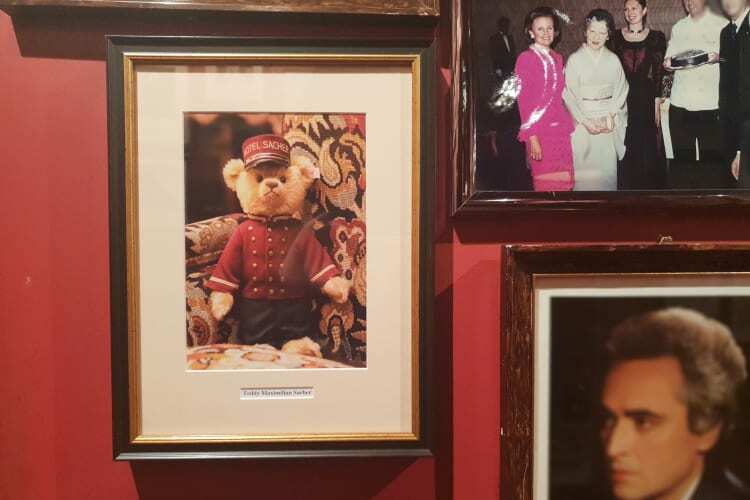 Among them we notice, our king and queen Philippe and Mathilde of Belgium, the actor Nicolas Cage, Mika the singer and of course the unmistakable and iconic Romy Schneider. 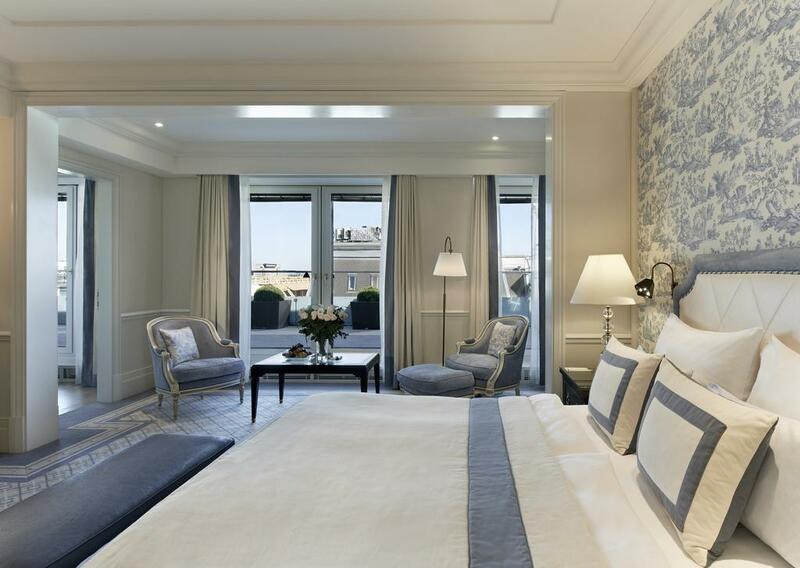 Once checked in, we receive the key to our room and leave, accompanied by our headdress-less concierge, we discover our new living space which blesses us with a breathtaking view of the historical monuments of the city center. 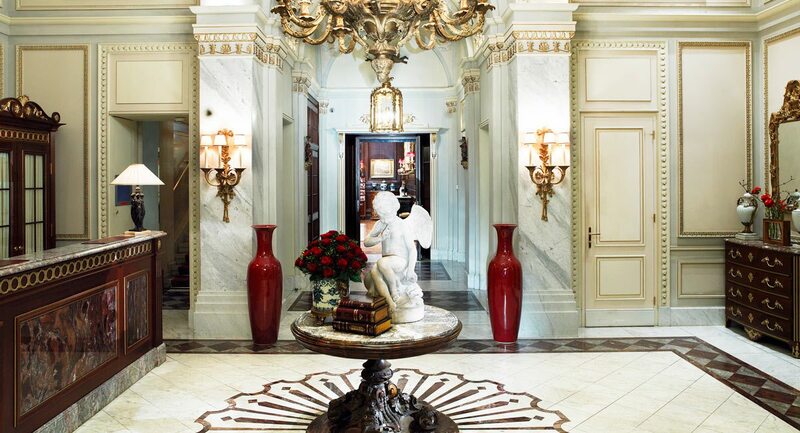 We cannot hide our joy to the concierge. 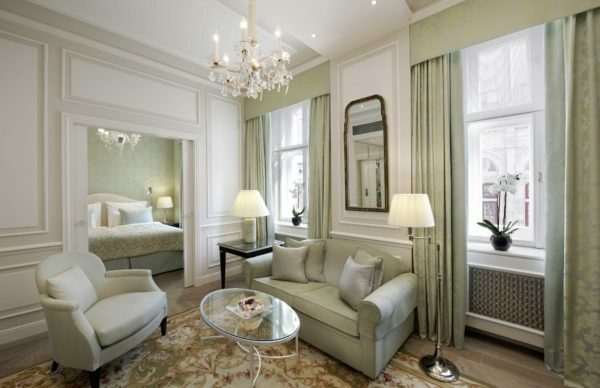 Our room is incredible ! 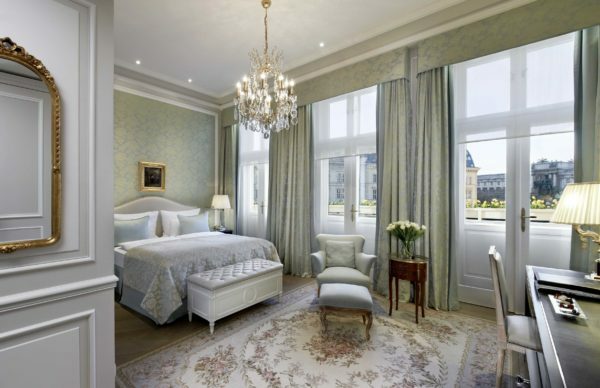 Our room has an extraordinary view on the Imperial Palace and the Albertina museum which houses art works of Cézanne, Modigliani, Rubens and even Raphael. We are in a dream. The design is rather classic, with a baroque style. 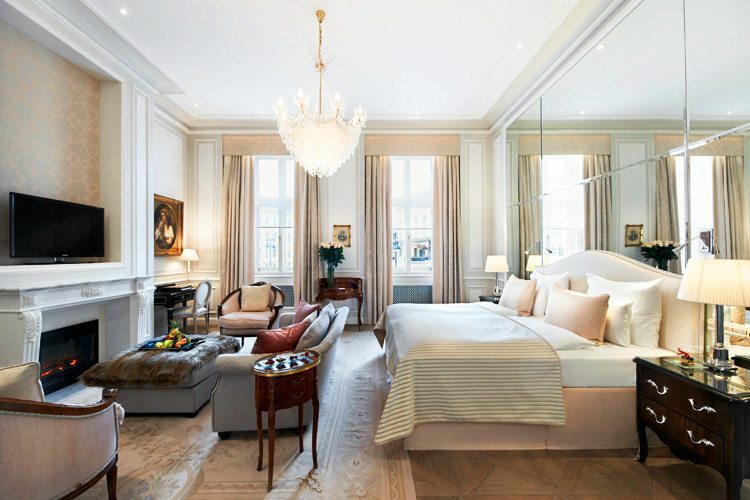 The main colours are gold, gray and beige. On the ceiling, a coloured chandelier which reminds us the one in the hall way of our Roman country house. We feel right at home. On the living room table, we find edible welcome gifts of mostly renowned local delicacies. 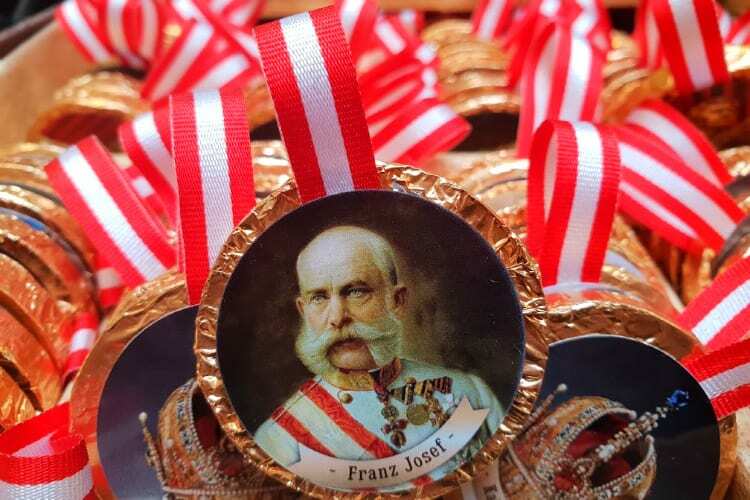 Between the chocolates and fruit, mini Sacher pies have found their way, this famous Viennese dessert is fought over by both locals and tourists in the hotel boutique, and i will tell you its story further on. Since our arrival, our little prince has been the center of attention. 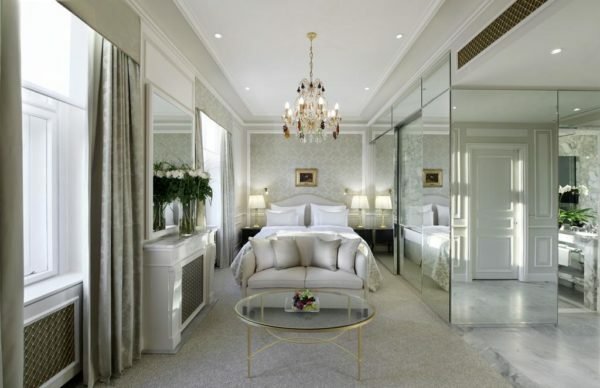 As we leave our room the concierge gives him a mini passport on which, just as a friendship journal, he must share his favorite colour, dish and animal as well as the nickname he wished to go by during his stay. 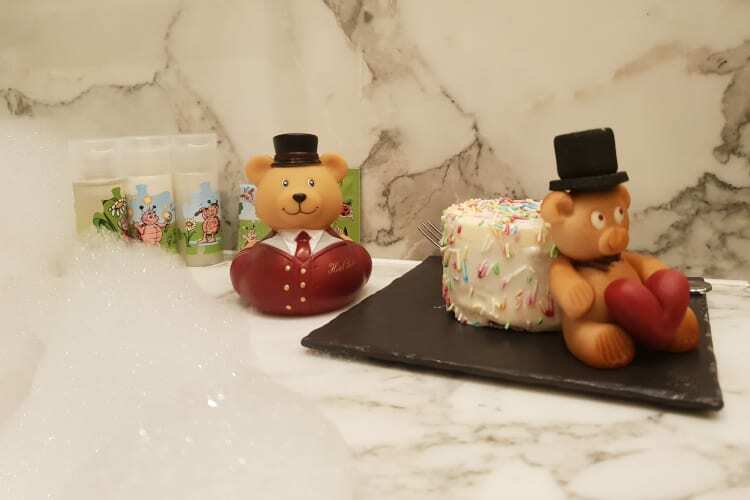 In the bathroom, on the side of the tub we found and elegant bath robe for children, but also baby cosmetics by Cocci Nella and a toy for the bath in the shape of Franz, the bear mascot of the hotel. Oscar is happy to see his friend the doorman with his special look at around 16h00, as he brings to our room a small cake covered in icing with a Franz this time made os marzipan and not plastic 🙂 Daddy devoured it while taking his bubble bath, Oscar is very amused by this sight. On the desk, a beautiful illustrated book and a wonderful colouring book have been left for Oscar ,which shows the different installations and experiences of the hotel. At breakfast, Oscar serves himself freely at the buffet exclusively made for children. 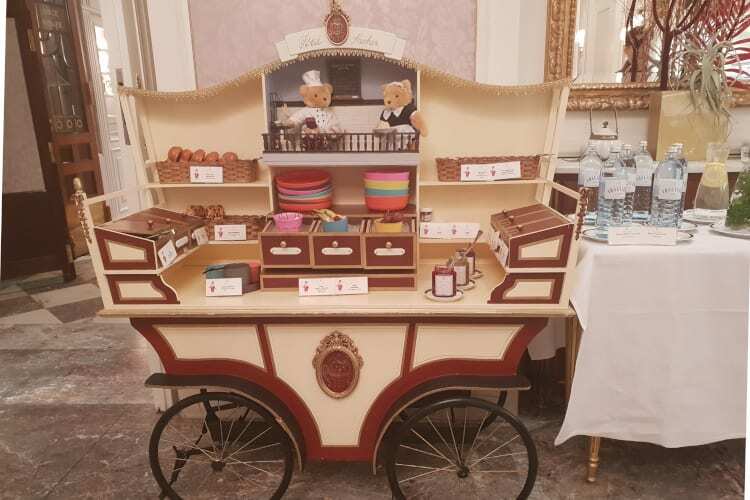 Housed in a small wooden horse-drawn carriage, mini-sized, the buffet features small jars of jam and chocolate spread, fruit, bear-shaped cakes, and other lovely and delectable treats. At around 8 P.M, a concierge knocks on our door and delivers us some Lindt chocolate before wishing us a lovely night. One hour later a maid comes to clear our plates from dinner ordered earlier with room service and will also leave us some chocolate delights. Tonight’s plan is set : Netflix and chill with chocolates. 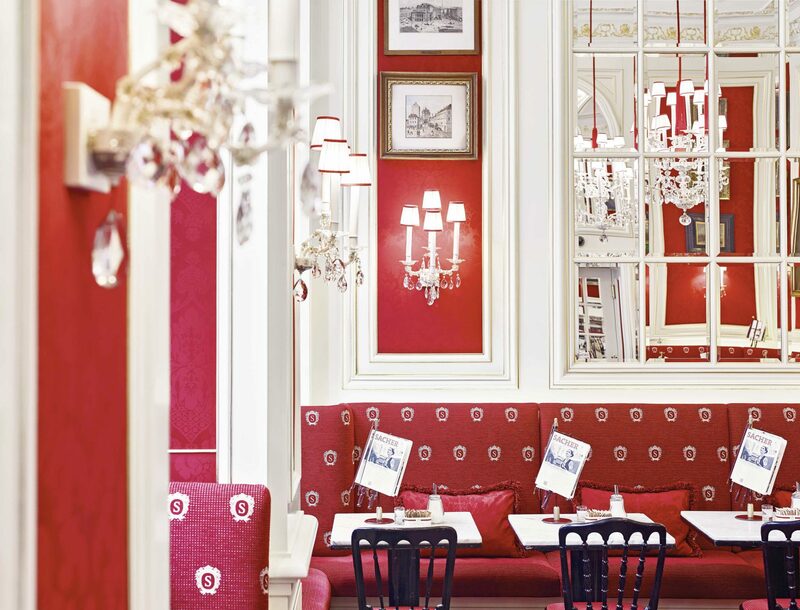 The hotel brings together a many interesting gastronomic addresses and experiences, however if there is one that should capture your attention is has to be the Sacher Café. This is where our hosts, locals and tourists rush to from early in the morning till the afternoon to taste the famous Sacher Pie. 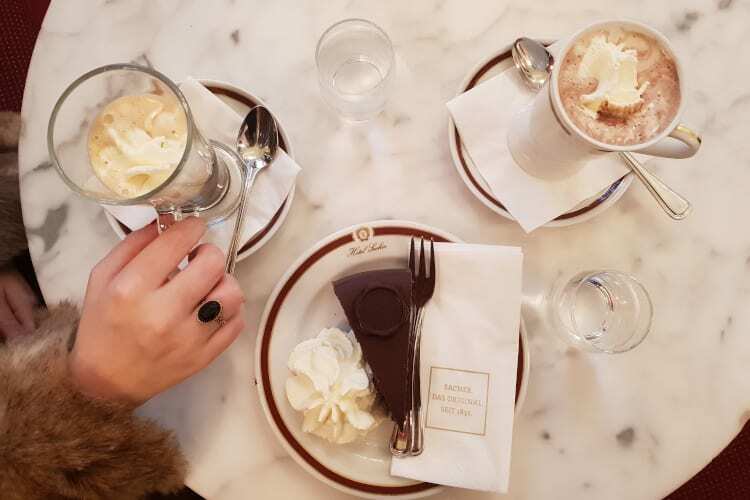 Serves with whipped cream and a warm drink, this dessert was invented in 1832 by a 16 year old apprentice named Franz Sacher.This young prodigy had the prince of Mettenich taste his creation who adored it and turned it into a real Viennese institution. Thanks to Oscar’s illustrated book, we come home to Brussels with the original recipe of the most famous chocolate pie in Austria. Early morning my husband and I take the elevator down to the spa for a moment of well deserved relaxation. We have left Oscar with a nanny from the babysitting service of the hotel. When we left the room they were both going through the illustrated book of the Sacher. As we leave the wellness center, the hostess shows us a full menu of specific treatments available for children from 8 to 14 years old : Manicures, pedicures, facials, etc. 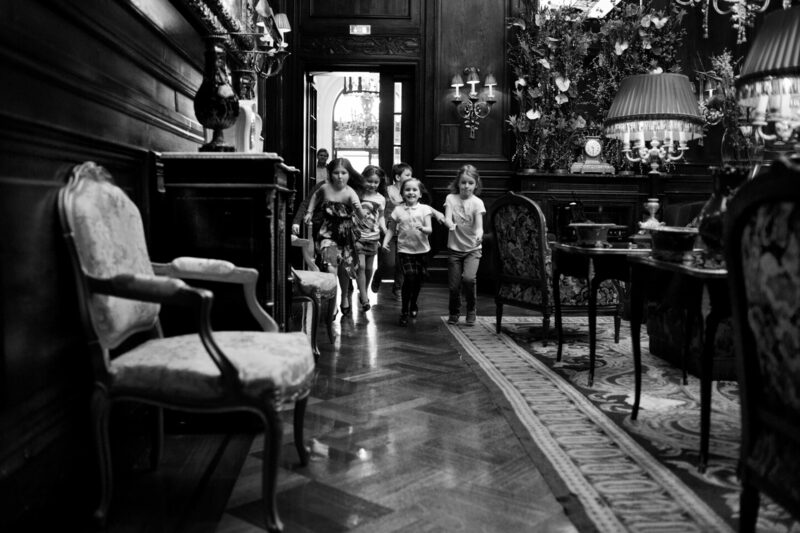 Children are truly kings at the Sacher Vienna! 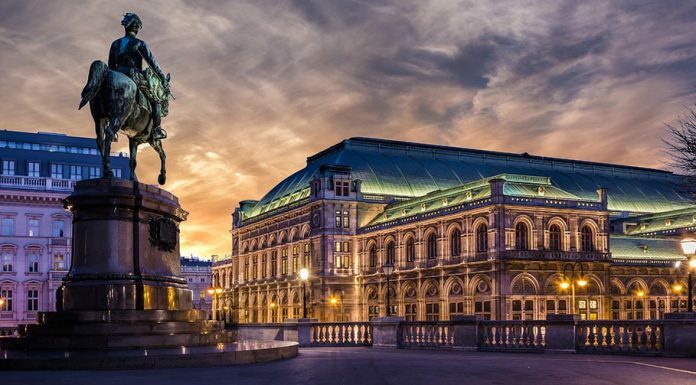 Ideally located in the historical part of Vienna, the hotel is close to the main and most visited sites of the city, for example the opera is less than 50 meter away from the Sacher. 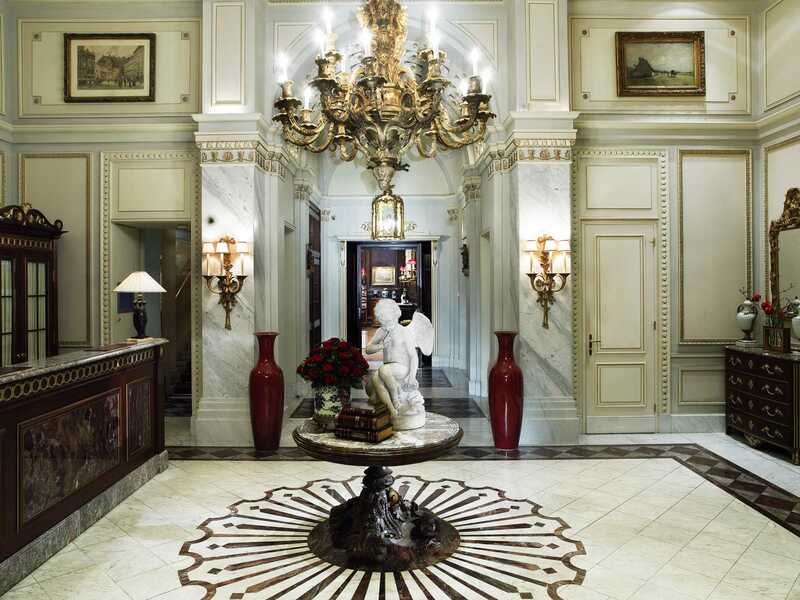 The stroller that we reserved with our concierge is waiting for us at the entrance of the hotel. 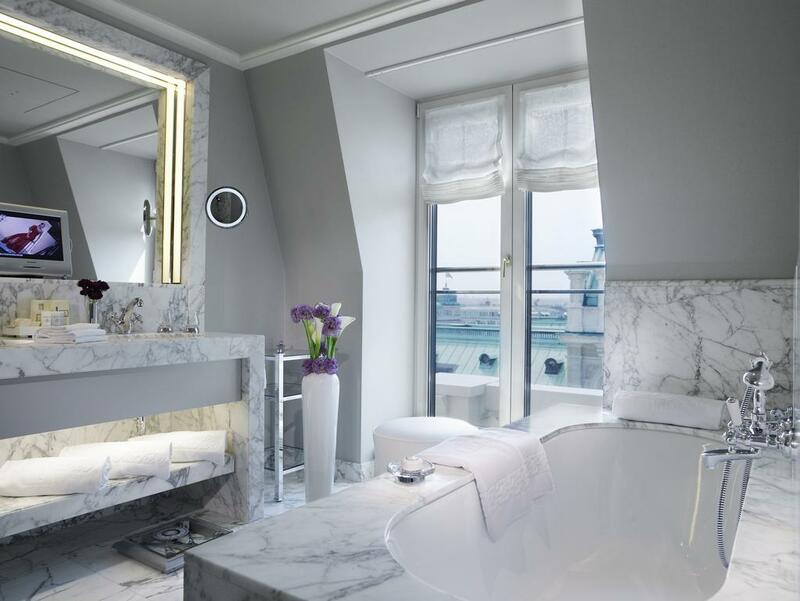 As soon as we get it we are off to visit Sissi’s apartments, only a 6 minute walk away. 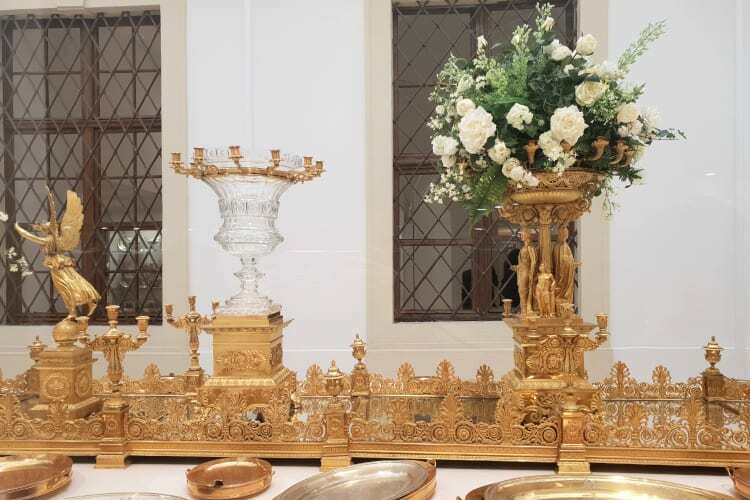 The museum exhibits remains of the Imperial Palace as well as an impressive silverware collection. Just like all children of his age, Oscar, has only eyes for the gift shop which is filled with souvenirs for little ones. Many carriages can be seen in the capital. 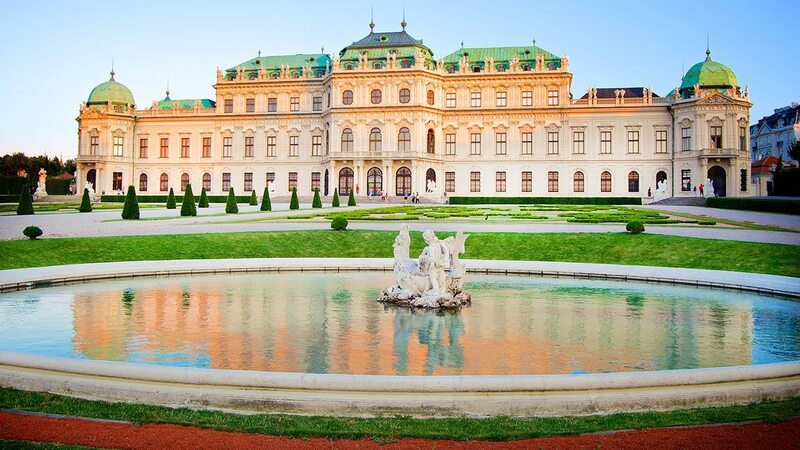 Pulled by magnificent horses, they browse the city center in minutes all the way to the Belvedere Palace, a place that we are excited to discover because this is where, among others « The Kiss » by Klimt is exposed. The site is huge and beautiful. Thankfully big enough to welcome its numerous visitors passionate about history and art. 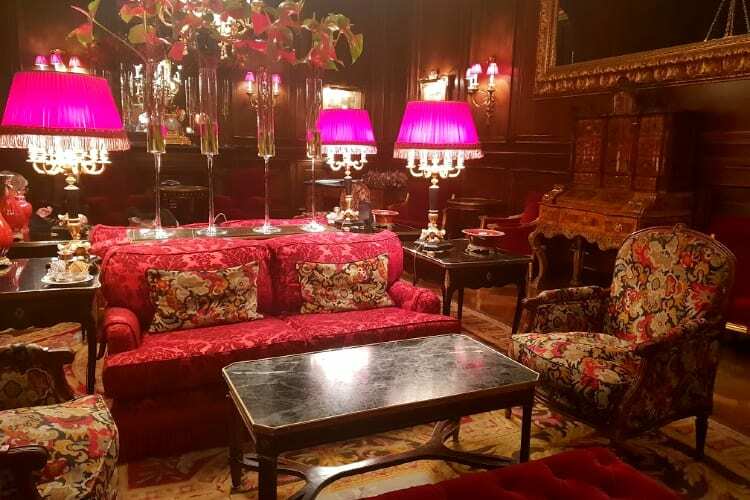 So many things to do, to see, and it is already time to leave the Sacher. Oscar is for one last time at the center of all attentions. 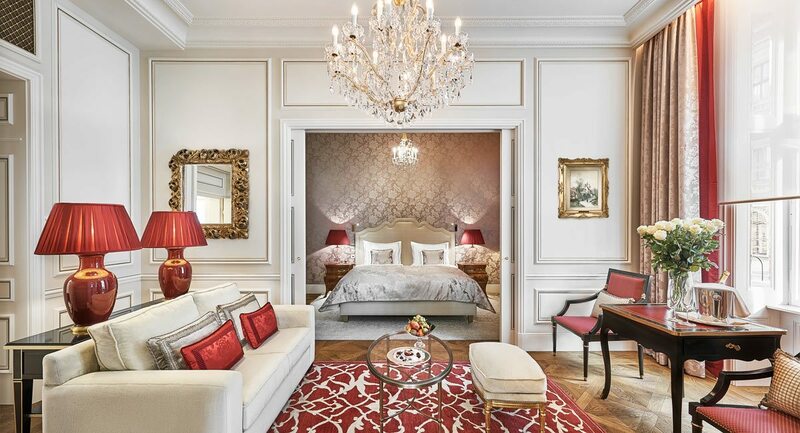 We are delighted by out stay but mostly very impressed by the quality of the « Little Sacher » program, tailor made by the family who owns the establishment. 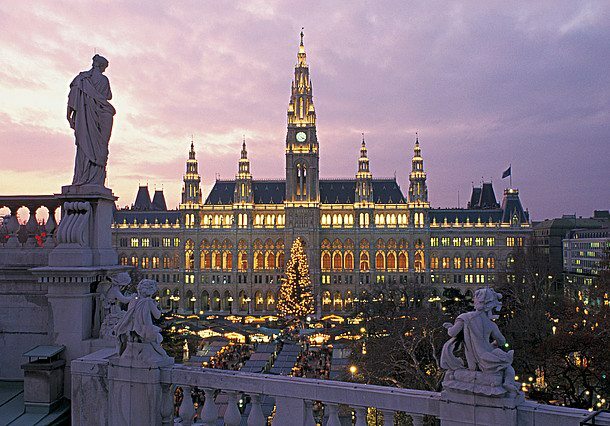 There is no doubt that we will be returning to Vienna soon, to this mythical address of the old imperial city, elegant as well as family oriented, it has surpassed all our expectations. We could not have dreamed of a better place! Thank you Little Guest!